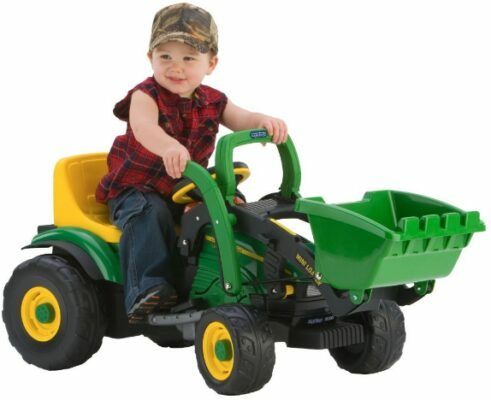 Tractor power wheels are a great toy for boys and girls of all ages. Some models are suitable for toddlers as young as 1 year old. On the other hand, many of the toys are also large enough to hold children up to around 7 years old, so you are sure to give your child years of fun by buying them a ride-on tractor. There are loads of different models of power wheels to choose from, some electric and some pedal-powered. Many of the toys are modeled around real tractors from big brands. These eye-catching ride on toys are sure to delight all children who love watching tractors working in the fields. There are lots of things to think about when choosing tractor power wheels for your little boy or girl. Here are some of the most important things to consider in order to find the perfect tractor ride on. Age – Check what age range the product is suitable for prior to purchase, to ensure it will be the right size for your child. If your child is too young, they may find the toy too difficult to operate. If they are older than the recommended age limit, they will probably be too tall or heavy to safely ride in the tractor which may lead to it becoming damaged. Electric or Manual – Some of the models here are electric whilst others are powered by manual pedaling. Each has its advantages and disadvantages, so think about what would best suit your child’s needs. For those with a smaller area to use the tractor, manual might be better as they are often slower and easier to turn quickly. Added Features – You might wish to look for bonus features to give your child an even more fun ride. Some examples are MP3 connectivity, a working horn or headlights or a trailer to bring along toys and snacks, or even to carry a friend on some models! Safety Features – This is particularly important when buying for a young toddler. Make sure there are age-appropriate features, such as a speed limiter, a safety belt and automatic brakes. You may wish to look for these features for older kids too, for added peace of mind. There is a total of 25 different types of ride-on toy tractors, cars and vehicles that are all part of the Ride-On experience that every kid wants. You can find a range of prices and each toy vehicle is slightly different, from eletric tractors to self-drive pedals there is something for every child in this review. This is the ultimate power wheels for any young tractor lover. It has loads of extra features to add to the fun, including a real, working FM radio. The trailer is large enough to carry a range of goods – your child will love carrying and moving things around as they pretend to work on their farm! This electric tractor is great for kids of all ages. The seat is adjustable to fit growing children, and the armrests can lift up to allow for easy access. There are two forward speeds, 2mph and 4.5mph, and one reverse gear. The higher speed can be locked out for younger children until they can drive the tractor confidently. 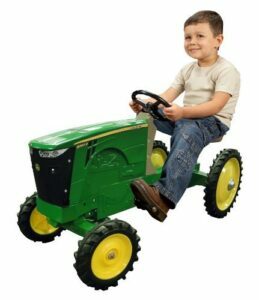 This ride-on tractor has high traction wheels, which work well on just about any surface, so you can ensure your child will be safe wherever they are riding. This pedal-powered kart is great for 5 year olds who love tractors! The larger size means it’s great for older children to enjoy too. The rear tires are 18 inches tall to make sure your child is just the right height off the ground, leaving plenty room for growing kids. The comfortable molded plastic seat ensures a comfortable ride for your child, even on longer journeys. There is a pretend dashboard to keep your child entertained when riding the tractor kart, and the smokestack adds another nice visual touch. The brakes are activated by pedaling backward. Continue to pedal backward and the kart will begin to reverse. This is a great looking off-road power wheels. It has two seats, making it perfect for large families, or sharing with a friend. The dump bed works much a real one, lifting up allowing your child to deposit the goods they have stored. This is great for encouraging imaginative play. The John Deere ride-on Gator has adjustable seats perfect for growing children. Also, the higher speed can be locked out, making it safer for younger children to ride. The brakes automatically engage when the child removes their foot from the accelerator, meaning even young children will be able to drive this vehicle with ease. 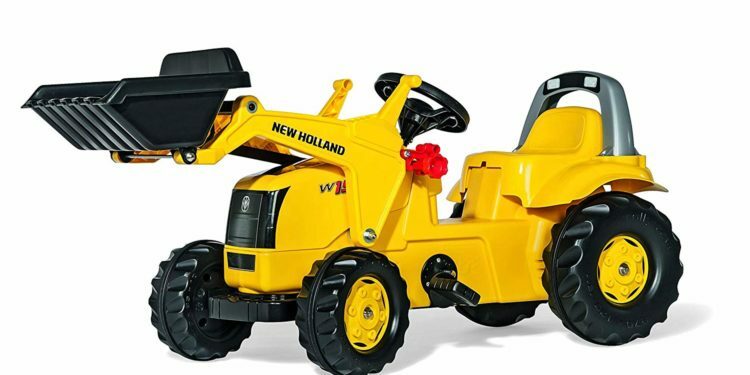 This yellow ride-on tractor is great for children aged around 2 to 5 years old. There are lots of fun features to keep little farmers entertained, the main one being the front loader. Kids will love to scoop up their toys in the bucket at the front of the tractor – which is easily controlled with the lever. The maximum weight capacity on this tractor is 75 pounds. It also has oversized tires which have rubber tread to ensure they last well, meaning your child can enjoy years of fun. The pedals are non-slip too, so your child will be safe when they are riding. This pedal-driven ride-on tractor is great for kids aged 3 to 7 years old. They will love pedaling around the yard collecting objects to carry in their trailer. The dashboard comes complete with stickers to give it a more realistic appearance. The wheels offer excellent grip on a variety of surfaces from grass to gravel. The seat is adjustable too, to ensure your child has a comfortable ride no matter how tall they are. There is a drinks holder, so your kids can really travel in style. The chain which powers the tractor is fully enclosed, so you can be sure your child can’t hurt themselves on it. It is easy and comfortable to drive, and your child will learn how to drive it in no time. This John Deere ride-on pedal tractor is great for children aged 3 years and older. It has a life-like appearance – the front hood lifts up and there is an exhaust pipe molded onto the hood. The seat has 3 different positions, to accommodate growing children. The rear tires are large and have rubber tread to ensure a strong grip on a variety of surfaces. If the tractor ride-on does tip, there is a roll-bar to help protect your child from injury. The tractor has both front and rear hitches to allow accessories to be attached. The tractor requires some assembly, but this shouldn’t take too long and isn’t overly difficult. It is made of high-impact plastic, which means it can stand up to a few bumps and crashes without becoming damaged. This Peg Pegero tractor power wheel comes with a working front loader, perfect for scooping and shifting any items your child chooses. It has automatic breaks, which engage when the accelerator stops being pressed, making it very easy for your child to stop. The tractor power wheels is great for beginners, as it offers two-speed settings, as well as a reverse option. Like some other models, the top speed can be locked for younger drivers, so parents can rest assured their child won’t take off. 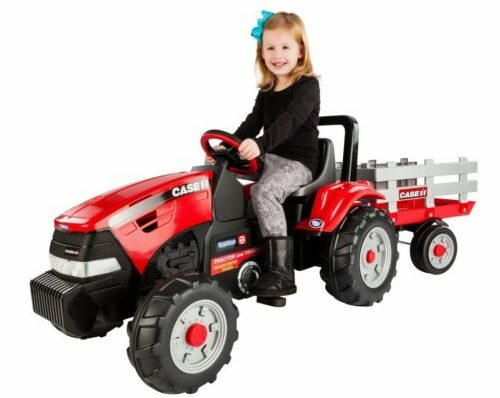 Children of all ages will love to help mom and dad around the yard with their new tractor. They will quickly learn how to operate the front loader and be ready to help in no time! This smaller power wwheelis great for toddlers. It travels at just over 2 mph, and can be used indoors or outdoors. It is driven by a foot pedal, which acts as the brakes when released. This makes the vehicle easy to control for even the youngest little drivers. The tractor is powered by a 6-volt battery and comes with a charger. 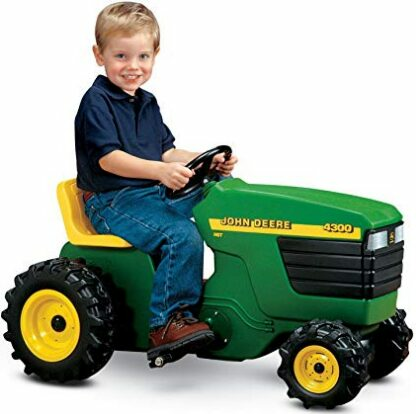 The seat on the tractor can be adjusted, making the toy perfect for children aged around 2 to 4 years. Little farmers will love to scoop and dump items with the front bucket, which is easily controlled from the driver’s seat. This tractor and trailer ride-on is perfect for toddlers to zoom about the house or outside. The maximum speed is just over 2 mph, making it easy for young drivers to control. A 6-volt rechargeable battery and compatible charger are included, meaning you don’t need to purchase anything else to get going. The trailer is just the right size for your toddler to carry their favorite toys when they go out for an adventure. The tractor can be used on a variety of terrains, such as short grass, dirt or hard surfaces. This means your little farmer can take their new tractor just about anywhere! This pedal tractor is great for little boys and girls who love to help their parents out in the yard. The functioning front loader is great for scooping and carrying loads, and your child can dump them across the yard. The loader is easy to operate from the drivers’ seat – your kid will pick it up in no time. The tractor drives well on a range of terrains, making it perfect for urban or rural settings. The adjustable bucket seat ensures a comfortable ride for children aged roughly 3 to 7, or weighing up to 85 pounds. The chain is fully enclosed for safety, so parents can be sure the risk of injury is very low with this toy. This pink ride-on tractor is perfect for little girls who want to become farmers! It is ideal for children aged up to 7 years old. It’s also perfect for younger drivers too, thanks to its speed limiter. Older children will enjoy travelling at speeds of up to 4.5 mph. The electric tractor comes with a very large trailer, perfect for your daughter to carry their cargo around. This is great for encouraging imaginative role play. The seat is adjustable and also has folding armrests, so you can be sure your kid can travel in comfort as they grow. The 12-volt power wheels come with automatic brakes. It also features wheels which provide great traction on a range of surfaces. This is a perfect tractor toy for toddlers. It has an adjustable bucket seat, to ensure your child can still ride comfortably as they grow taller. The durable wheels ensure your child can keep on riding their tractor without it becoming worn out. Riding the tractor is a great way for kids aged 2 to 4 years old to burn off some energy. Parents will love how keen their kids are to play outside once they have access to this ride-on! It has a realistic appearance, including decorative headlights and a dashboard. It also includes a small trailer for your child to take their favorite toys for a ride. This is a great ride-on tractor with functioning diggers to challenge your child. They will love mastering the front and rear diggers and use them to carry sand or dirt around the yard. 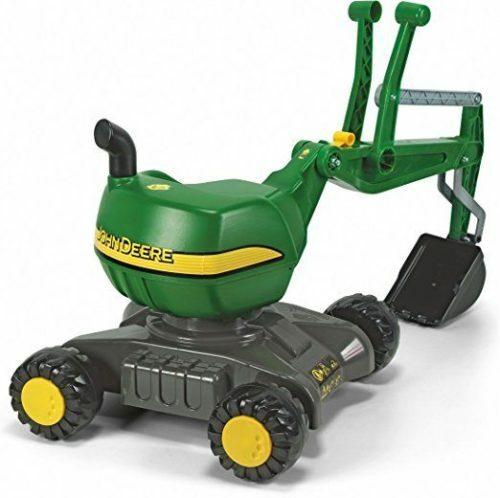 The Working Loader and Backhoe Digger is AWESOME and is easy to use and function for kids! The pedal-powered tractor is great for children aged 3 years old and over. The seat has two different positions, perfect for growing children. It can hold children weighing up to 75 pounds, meaning you can be sure your kids will have many, many hours of fun with this tractor. The ride-on toy comes with a hitch for adding a trailer if you wish. This makes it great for kids who want to bring some toys or snacks along on their ride. This trailer is a great accessory for any John Deere ride on tractor, electric or manual. The trailer is a great size at 21 by 14 inches, and can hold up to 15 pounds. This should be more than enough for your child to take their cargo around. The trailer is easy to hitch up to your tractor, with a simple locking pin. The sides of the trailer can be removed if your child wishes to carry something a bit larger. Before purchase, be sure to check that the trailer is compatible with the tractor ride-on that you have, or are planning to buy. This trike-style tractor is great for children as young as 2 years old. It can be used by children up to age 8, thanks to the adjustable seat. The trailer is detachable, so you can choose whether to use it or not depending on the situation. The hitch can also be used to attach other accessories, available separately. There is a functioning horn and engine noises on the tractor, sure to delight children of all ages. Parents will be pleased to know that very little assembly is required. The air tires have a rubberized tread to ensure they give perfect grip on a range of different surfaces. 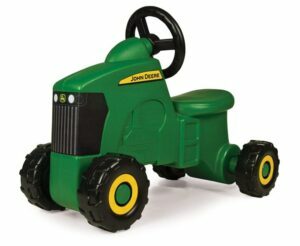 This stylish John Deere tractor is perfect for kids of all ages. It can hold a maximum weight of 80 pounds, so you can be sure you will get great value for money – your child will enjoy reading this for years! The tractor is well-made, with a solid and durable frame which can withstand a few bumps and crashes. The tractor has a nice lifelike appearance sure to be popular with young tractor lovers. There is a hook on the back for towing goods, although you will need to purchase any accessories separately. The pedals are easy to reach, thanks to the adjustable seat, and the tractor is easy to steer and control. This is a great first ride on tractor for younger children. It is operated by pushing the feet off the ground, and as such it has no pedals or electronic components. The wheels are set widely apart to allow for easy balancing. Toddlers will have great exercise pushing themselves around on this tractor, and it can be used either indoors or outdoors. This pedal tractor Model 8360R is great for older or taller children – it can hold up to 130 pounds. The seat can be moved into 4 different positions, ensuring a comfortable ride no matter what. The steel tractor looks great – it’s sure to be loved by both parents and kids alike. It is more durable than some plastic models – it won’t become brittle or fade in the sun. There is a hitch at the back to attach a trailer, which is available separately. The tractor drives well on different surfaces including grass, and can also go up slight hills thanks to the level of resistance in the chains. There is some assembly required, but it is worth this additional step as it is such a great quality toy. This pedal tractor is great for kids who are looking for something a bit more advanced with extra features. The front loader is great for children to shift sand, dirt or snow around – they will love to help their parents with work in the yard! There are two gears, which means your child will easily navigate small hills and different terrains. Unlike many similar models, this Rolly Toys tractor has a handbrake which can be used both for stopping as well as helping when lifting heavier loads. The tractor is great for children up to 8 years old. Assembly is relatively quick and easy, so your child will be ready to roll in no time! 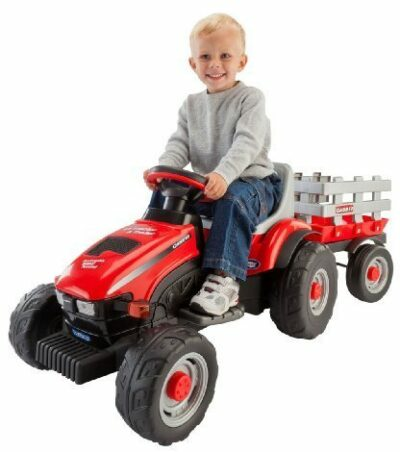 There are additional accessories available to go with this tractor, so you can add to the fun as your child grows. This is a great digger ride-on toy which offers something a bit different from the usual tractor sit-and-rides. Your child will love learning how to operate the scoop to lift sand and dirt and transport it around. This is great for them to improve their co-ordination, whilst having great fun at the same time. The digger toy can be used by children weighing up to 75 pounds – it is best for kids between 3 and 6 years old. It can roll forwards and backward, whilst the digger arm can rotate in 360 degrees around the base. Children will have hours of fun with this toy as they learn how to scoop and dump. They will love the range of movement, and parents will love the durable construction. If you are looking for the very best tractor power wheels for your child, it’s well worth investing in the Peg Perego Gator. It has everything you would expect from a top of the range power wheels, such as two speeds, automatic brakes, and adjustable seating. There is enough space for two children to sit, making it perfect for sharing with friends or siblings. Children of all ages will absolutely love the functioning dump bed and realistic appearance of this John Deere ride-on. If you are looking for the best ride-on tractor at a great price, the Peg Perego Case IH is a perfect choice. The pedal tractor is easy and safe to use, and it comes with a large trailer for children to carry their cargo around. The sturdy plastic ensures your child can have years of fun with this tractor – it is best suited to kids aged between 3 and 7 years old.